How do the news producers and newspaper editors decide what to print and broadcast on TV? Conspiracy theorists love this question because it gives them a chance to point out how most national news organizations always cover the same stories. Yes – that happens, but is it a coincidence or has the media been indoctrinated to all chase the same news stories? Here’s an insider view on the media from someone who spent time as an Executive Producer with NBC and Senior Producer with CBS in New York — the places where these conspiracies all allegedly begin. Every news outlet wants to run enterprise and original stories, but the open secret inside every newsroom is most editors, news managers and producers are afraid of failure. That’s right – they’re afraid of pitching a bad story idea that no one will like. If the public doesn’t buy, read or watch their stories, those reporters and reporters who pitched the story know they will lose credibility in the newsroom. And once a journalist loses credibility, he has an uphill battle, especially in competitive New York newsrooms where the flavor of the month usually melts before the end of the day. If you want a story written about your business, you need to cite a reason why people will want to watch. You need to explain why the newspaper readers will benefit from your story. You can improve your chances for coverage by understanding how viewers and readers think. And in just in case you’re wondering, how do viewers and readers think? Pretty much just like you and me. That’s why I still believe the best journalists and story tellers understand themselves first. The more you understand human behavior, the better you are at driving news coverage for your business. The mainstream media, politicians and advertisers are catching onto what most Latinos knew 20+ years ago. Hispanics are a huge consumer market and if you can tap into their families, you will have a growing business. The CMO of Coca-Cola recently told an influential crowd of advertising executives that Hispanics are a key part of Coke’s growth strategy through 2020. When I was an Executive Producer with NBC, I co-founded the NBC/Telemundo Hispanic Forum, which brought Latino journalists from the English and Spanish news divisions together for networking and mentoring sessions. You would think with my media experience and culture, I would have thought of targeting Hispanics when it came to finding new business. But guess what: I learned the hard way like many entrepreneurs. It took meetings with three different clients (who are not Hispanic) before I realized I was missing out on reaching a key growth opportunity. They all wanted to know how they could market to my culture via the media. After the light went on in my head, I pitched my law firm client to CNN en Español. Roughly 5-minutes later, I heard back from a CNN producer, saying she loved my story. That segment ended up running on the program, Dinero, which airs at 8pm on CNN en Español. For nearly 4-minutes, my client was an expert on legal issues in prime time. 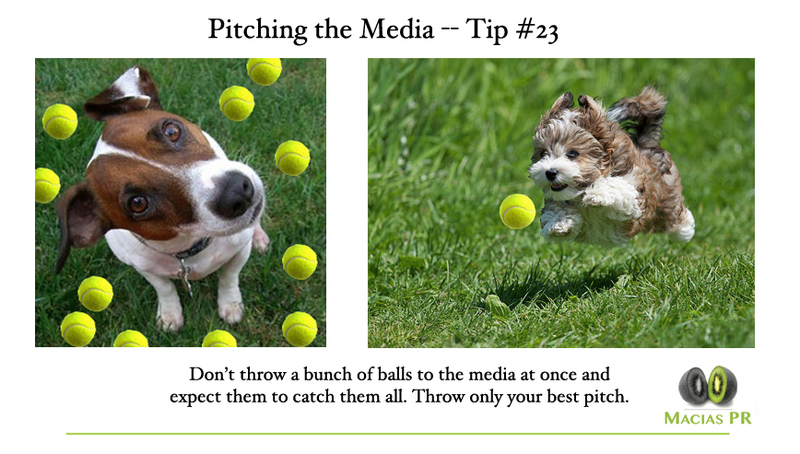 If you speak Spanish, start pitching the Spanish media because they need experts for their news stories too. Lawyers, accountants, financial consultants, nutritionists, doctors– they’re easy to find anywhere, but Spanish journalists need to look harder to find their equivalents for their audience. I don’t speak for all Hispanics, but I can tell you everyone in my family spends a lot of money to make sure we stay healthy and young looking. My vain family is a marketer’s dream. Loreal wants to reach my sisters. Banana Republic wants to reach my Dad. That’s why I’m now looking in the mirror and going after potential clients who are just like me. If you want to reach more consumers like me, give us a shout. 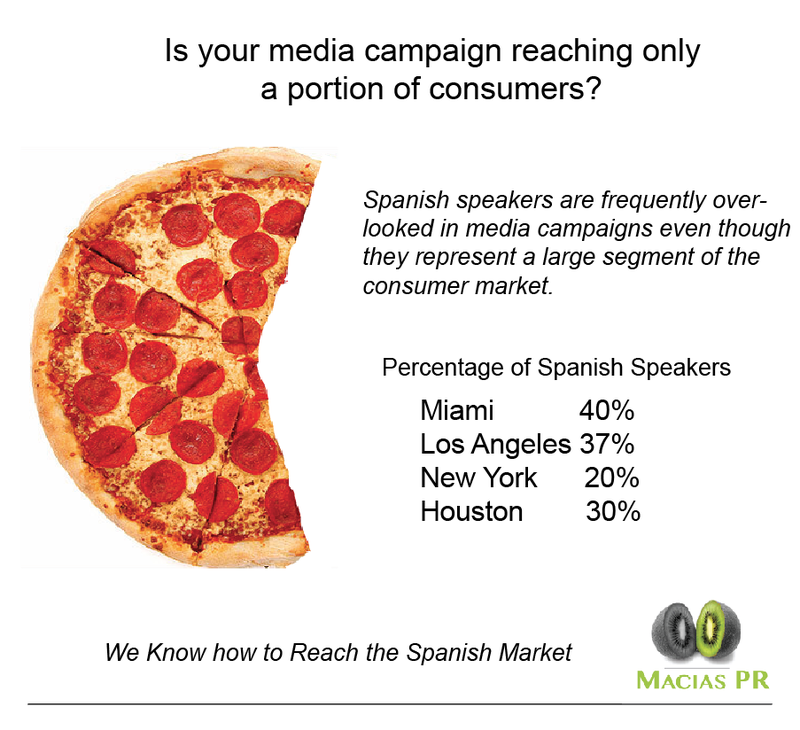 We’ll show you what we delivered for other clients in the Spanish market. Mark Macias is a former Executive Producer with NBC and Senior Producer with CBS in New York. 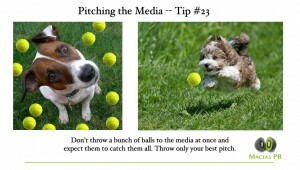 He’s also the author of the communications book, Beat the Press: Your Guide to Managing the Media. 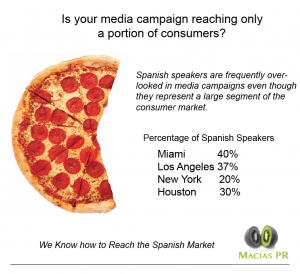 Macias now consults small and large businesses on how to get publicity. You can read more on his firm at MaciasPR.